Is Stand Up Paddleboarding Good Exercise? Is stand up paddleboarding good exercise? This is one of the most common questions people ask us when trying this popular water sport for the first time. 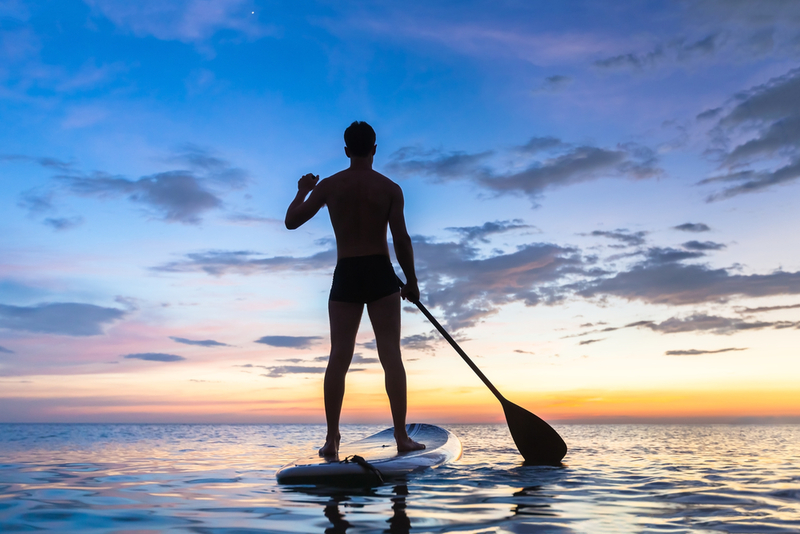 If you’re a health and fitness buff, you might be happy to find out that yes, stand up paddleboarding or SUP can indeed help you stay fit and healthy. Let’s take a look at some of the reasons why SUP makes an excellent workout. If your goal is to get abs of steel, then SUP is definitely something you should try. SUP offers you a great core workout. The twisting and turning motion when paddling will engage the core. At the same time, your core, back, and abdominal muscles are given quite the workout as you constantly try to maintain your balance. Unlike other forms of exercise and sports, SUP gives you a great workout without requiring you to perform vigorous body movements. As a result, you are less likely to injure your tendons and ligaments, or suffer from any spinal issues. Surfers will tell you that paddleboarding is some of the best cross-training you can do. Apart from helping tone your muscles, SUP also allows you to build upper body strength and endurance. It also works your aerobic system and gives your cardiovascular system a huge boost. Despite the lack of vigorous body movements, SUP gives different parts of your body a major workout, helping you stay fit and active. Coupled with a nutritious and balanced diet, SUP keeps you healthy and can help protect you from a wide range of diseases. Because it helps strengthen your cardiovascular system, it can help reduce your risk of developing cardiovascular diseases such as heart attack, stroke, hypertension, and diabetes. Since you are burning calories when you do SUP, it can also help you lose weight and improve muscle mass. SUP is a great way to way to relax and unwind. The mere fact that you’re surrounded by the ocean, enjoying the sunshine (hopefully!) and the great outdoors is enough to lower your blood pressure and stress levels. Exercise has also been shown to promote the release of serotonin and endorphins in the brain, giving you a feeling of peacefulness and happiness. If you’re not good at balancing on a board, don’t worry. The more time you spend up on a SUP board, the less likely you are to find yourself falling into the water. Over time, regular stand up paddleboarding improves overall balance as well as strengthening your joints and ankles. With all these health benefits, SUP is definitely a must-try, so book your hire SUP board today!